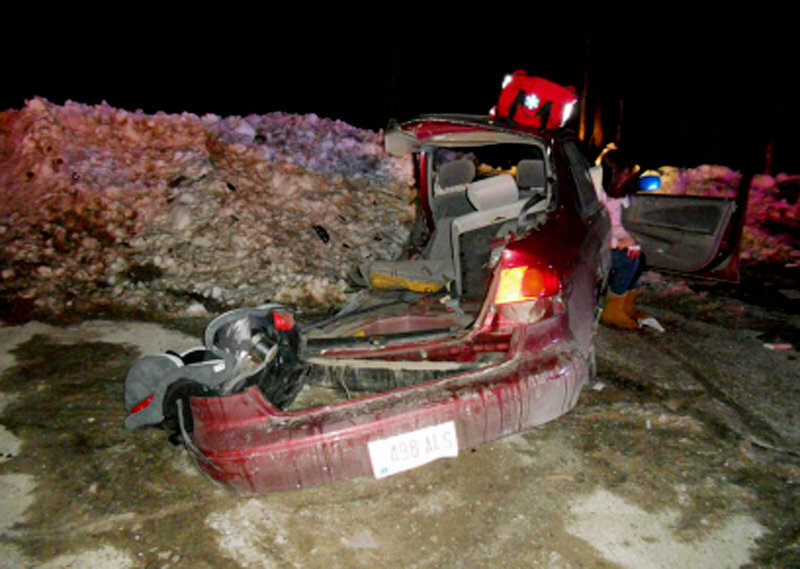 Six-month-old Gabriel Blaney was ejected from his car seat, soared 25 feet and landed in the snow. Still shaking, Angie Horler stared at the wreckage of the car she had just collided with in her pickup truck, and saw no movement inside. Horrified, she noticed an infant’s car seat on the ground in front of her. As motorists pulled over to check on the driver of the demolished car, Horler heard something faint, like noise from a car radio. She was the only one who heard it, she said. She followed the sound. At the bottom of the snowbank’s far side, she saw a dark splotch on the snow. Gabriel Blaney, just 6 months old, had been ejected from his car seat, soared 25 feet and landed on his side in soft snow in a small stand of trees — and survived. The hood of his dark blue fleece snowsuit was pulled back, and his face was partially pressed into the snow. Horler gathered him up and returned to the crash scene, where his mother, Chynna Blaney, 19, had been frantically looking for him. Injured, with blood on her face, Blaney screamed when she saw her son in Horler’s arms, then passed Horler a blanket to keep the baby warm against the night’s frigid air. Blaney then acquiesced to bystanders, who were concerned about her condition, and sat down to wait for rescue workers. A couple let Horler get in their vehicle with the baby and her own two sons to keep warm and wait for an ambulance. Chynna Blaney had been driving her 1999 Toyota Corolla east on Ledgehill Road in Raymond, a route she rarely took. She told police that she was avoiding tolls on the Maine Turnpike, which increased Nov. 1. Shortly before 5 p.m., she was fiddling with the volume on her GPS unit and didn’t see the stop sign at the intersection with North Raymond Road, said Capt. Don Goulet of the Cumberland County Sheriff’s Office. 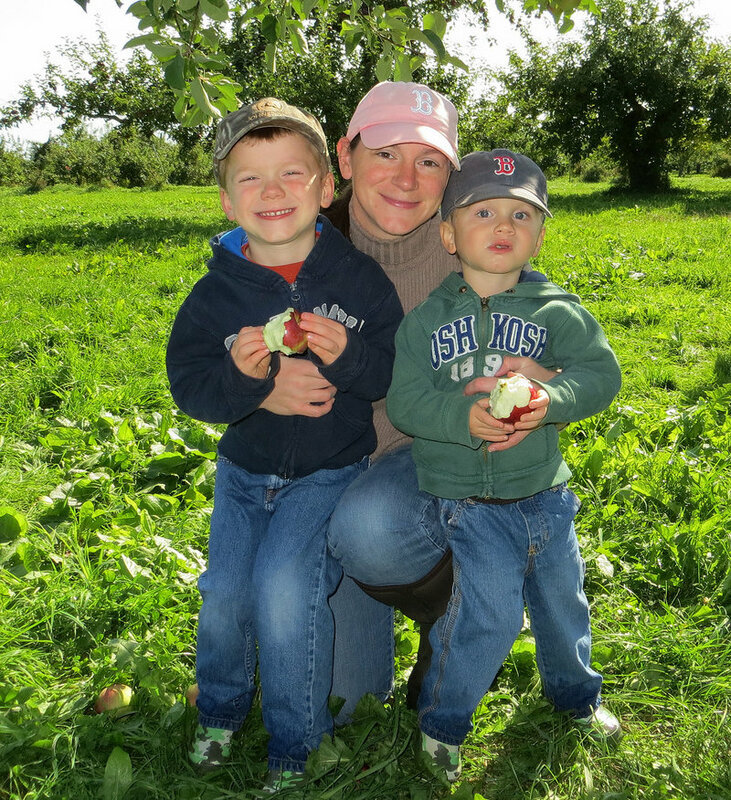 Horler, 35, of New Gloucester, was driving south in a 2003 Ford F-150 pickup truck, having just picked up her sons, ages 2 and 5, at preschool. She saw the Toyota at the last instant but couldn’t avoid the crash, she said. 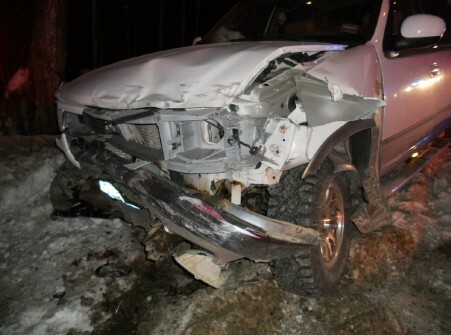 The impact crushed the front of the pickup and tore the rear driver’s side off the Toyota. 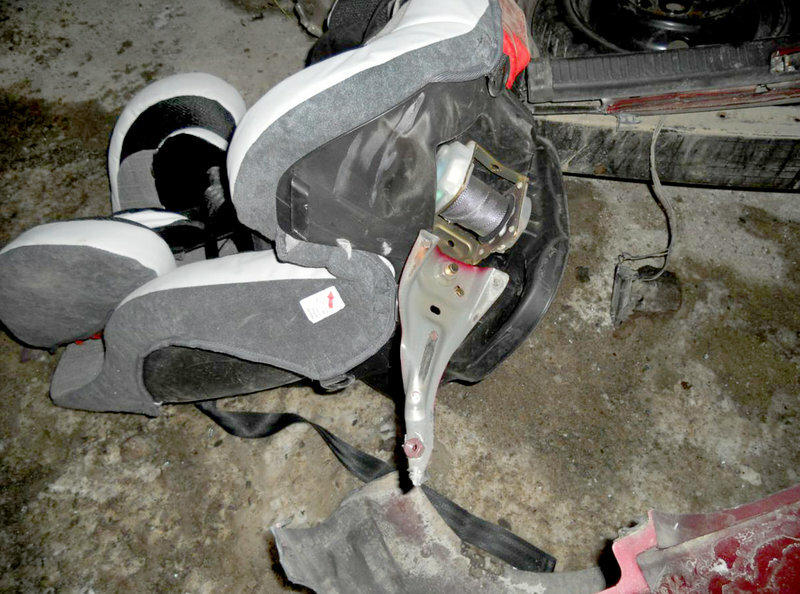 The car seat, which investigators say was properly secured, facing backward in the center of the back seat, was ripped free, still attached to the remains of the seat belt. Investigators say the impact may have whipped the car seat around with such force that Gabriel was thrown out of it. The child was taken to Maine Medical Center in Portland, where he remained in serious condition Friday with a skull fracture. Though no other information was available, authorities said a baby’s skull bones aren’t fully formed, so a fracture can be less serious than for an adult. Any skull fracture leads doctors to explore whether there is deeper injury to the brain, Mick said. Chynna Blaney was released from the hospital Friday. Authorities plan to cite her for failing to stop at a stop sign and being a distracted driver. Horler was taken to Mercy Hospital and released; her sons were uninjured. Officials were stunned by the baby’s good fortune and by Horler’s ability to find him, right after a harrowing crash. Messinger searched the back of the car for a baby, and wasn’t optimistic about any chances of survival. “I have seen car seats ejected from a motor vehicle with children in them. I have never seen a kid come flying out of one. That’s a first for me in 28 years of doing this,” said Messinger, who also is a full-time Portland firefighter. Goulet is asking the National Highway Traffic Safety Administration to examine the crash to shed light on why the baby was thrown from the car. No recalls have been issued for that model of car seat, an Evenflo Symphony. 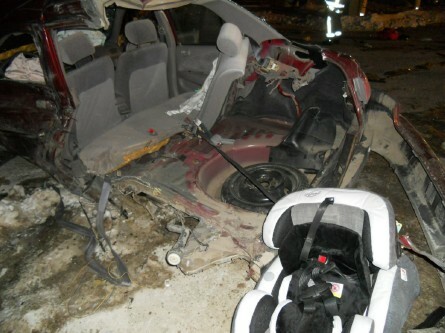 Goulet said the car seat was brand new, and the harness was intact and still buckled after the crash. Authorities say they believe that Blaney had Gabriel in his car seat — it’s unlikely that he would have survived otherwise — but there is no way to tell immediately how effectively he was secured. Doctors may find scrapes on the boy from the harness straps that could shed light on the situation, Goulet said. “It just might have been the right set of everything happening which caused the kid to squirt out of it,” he said. Horler said she believes there was more at work than physics and luck.